In 2015, a group of Amazon employees kicked around ideas for a Kickstarter-like crowdfunding site. The idea didn't get very far, as they soon learned that the market was already crowded. Instead, they discovered that every retail startup was looking for someone to solve the same problem: how to get their products exposed to a wider audience. It was a problem Amazon knew how to fix. And so the team that initially thought about a crowdfunding site turned to a new idea instead: a site called Launchpad that's dedicated to selling and promoting products made only by startups. "What Amazon knows a lot about is going to retail, and we continued to hear that that's a big problem for startups," Jennifer Petoskey, Launchpad's senior marketing manager, told Business Insider. "Launchpad is like having an amplifier for what you as a startup is trying to do." Launched in July 2015, Launchpad is a marketplace for products made by startups. Amazon treats these companies like any other vendor, buying their goods at the warehouse level, but also giving them additional exposure through custom pages and a site solely dedicated to Launchpad members. These products are eligible for Prime's free two-day shipping and are also sold through Amazon's main website. Plus, through partnerships with VC firms, startup incubators, and crowdfunding sites, Amazon gets referrals on what the best startups are and easy access to buying their products. It's a win-win since startups get exposure to millions of Amazon customers while Amazon gets full access to some of the hottest startups. "The Launchpad is really more about helping startups become a vendor on Amazon super quick and easy," Petoskey said. "The major benefit is in the reach and exposure that we give startups." In just one year, Launchpad has seen quick traction. At launch last year, Amazon had only 25 partnerships with VCs, incubators, and crowdfunding sources and sold about 200 products. Now, it works with over 100 leading VC firms, including Andreessen Horowitz, and has helped over 700 startups sell roughly 1,400 products around the world. 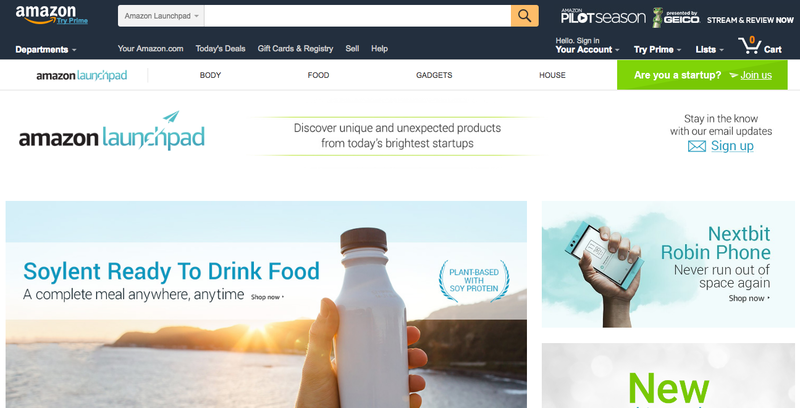 Soylent, the Andreessen-backed nutrition-juice maker, just announced its availability on Launchpad earlier this month, while other highly funded startups like Anki and Sphero also sell on the platform. "It's really a referral relationship with VCs and incubators. They view our program as just a great distribution channel," Petoskey says. There are two simple qualifications to applying for Launchpad. The startup must be able to get the product into Amazon's warehouse within 30 days of ordering, and the company should have a history of receiving funding, either from a VC, incubator, or crowdfunding service, as a way to prove its market appeal. Then Amazon reviews the products and puts in orders for the products it likes. As long as Amazon continues to place purchase orders, the startup will have its products sold on Launchpad. Eero, the home Wi-Fi system company, was able to gain strong traction by launching through Launchpad early in its life cycle, Petoskey notes. She says that the long-term goal of Launchpad is simply to increase the product selection for Amazon customers while helping startups grow faster. And, ultimately, that will help grow the overall ecommerce pie. "As these companies become successful in ecommerce, they'll continue to focus on ecommerce for their distribution strategy," she said.